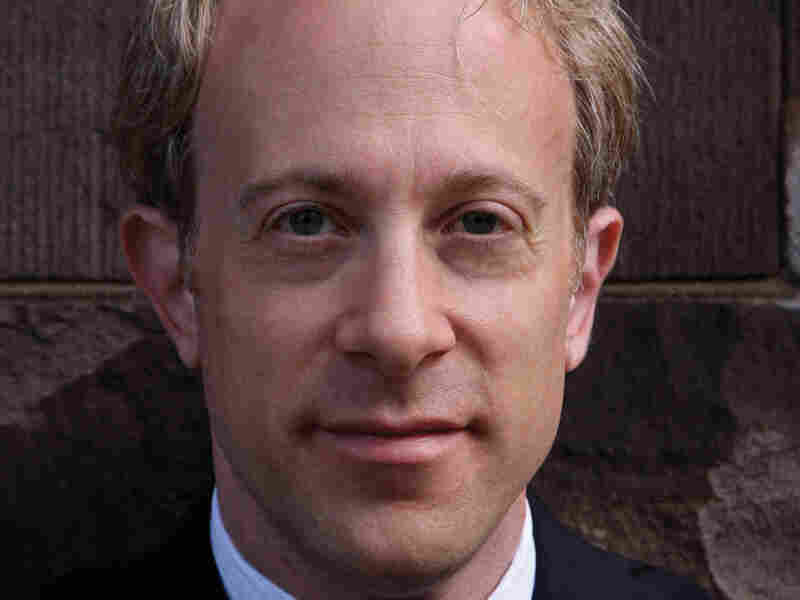 Book Review: 'Supreme Power' by Jeff Shesol — FDR And The Supreme Court: An Epic 'Power' Struggle Jeff Shesol's Supreme Power is the story of President Franklin Roosevelt, his struggle to institute the New Deal, and the Supreme Court's subsequent backlash. Critic Michael Schaub says the book breathes new life into a historic conflict. Roosavelt clashed with members of the Supreme Court, including Chief Justice Charles Evans Hughes (centre, front row), over his New Deal policies. Liberals and conservatives joined in opposition. It's no secret that the three branches of American government don't always get along — fights among the executive, legislative and judicial branches became a "dog bites man" story shortly after the founding of the republic. While it's tempting to succumb to nostalgia and assume that government was a kinder, gentler, more collegial institution back in the day, it's just not true. Case in point: President Franklin D. Roosevelt's epic fight with the Supreme Court, which began not long after the president instituted the New Deal — various parts of which the court wasted little time in declaring unconstitutional. 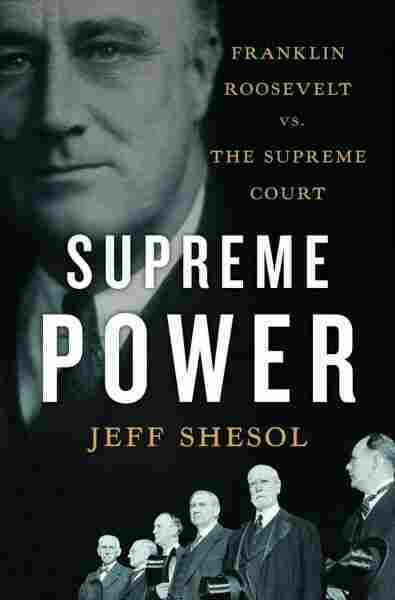 This is the fascinating power struggle that Jeff Shesol expertly chronicles in his new book, Supreme Power: Franklin Roosevelt vs. the Supreme Court. When Roosevelt announced his New Deal to alleviate the effects of the Great Depression in 1933, his proposed programs were met with wide public support (some of which would later subside). There were at least four Americans who weren't fans of his proposals, though — the "Four Horsemen" who made up the conservative wing of the Supreme Court. 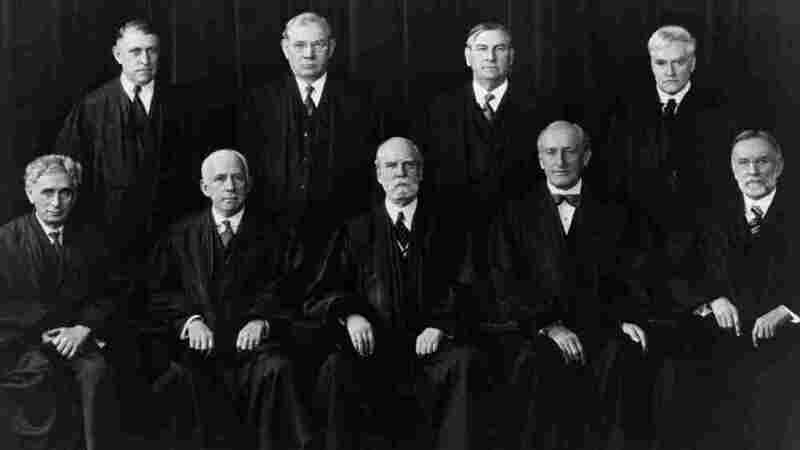 These justices were joined at times by Chief Justice Charles Evan Hughes and Justice Owen Roberts in striking down some elements of Roosevelt's proposals. 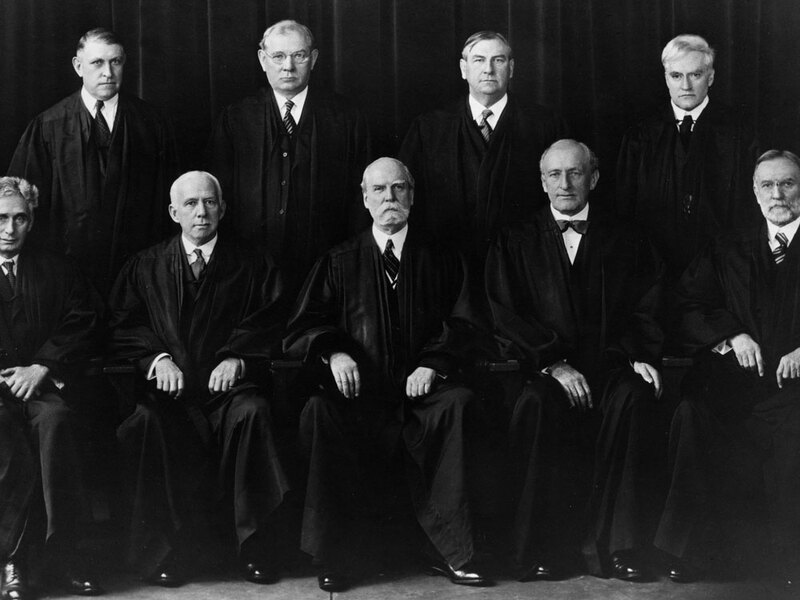 The president might have been able to take this in stride, but when the three liberal court justices joined with the rest to declare the National Recovery Administration (NRA) unconstitutional in Schechter Poultry Corp. v. United States, Roosevelt found the decision too much to bear. The NRA was the cornerstone of the New Deal, and Roosevelt felt the court had declared war on him. He would soon decide to declare war right back. Jeff Shesol was a speechwriter for Bill Clinton and is also the author of Mutual Contempt: Lyndon Johnson, Robert Kennedy and the Feud That Defined a Decade, which was a New York Times Notable Book of the Year. The president's solution was the Judiciary Reorganization Bill of 1937, the now famous "court-packing plan," which would allow him to appoint up to six additional justices to the court. While FDR was an indisputably popular president — he had just finished destroying the hapless Alf Landon in the 1936 election — his plan proved to be a severe political miscalculation. Mainstream newspapers were almost unanimous in their condemnation of the idea; making matters worse, the plan was hailed as a great idea by the Nazi press in Germany. The public sent thousands of telegrams to Congress expressing disgust. Even Roosevelt's own vice president, John Nance Garner, didn't approve — as Shesol writes, when the plan was announced in Congress, Garner "stood in the doorway of the cloakroom, holding his nose and making, for all to see, a thumbs-down gesture." Conventional wisdom holds that the plan was obviated, and then defeated, after the court ruled in favor of a state minimum wage law in West Coast Hotel Co. v. Parrish — Justice Owen Roberts' apparent change of heart became known as "the switch in time that saved nine." Shesol explains that this wasn't exactly the case, though; his fascinating interpretations of the effects of the ultimately failed court-packing plan definitely aren't what you learned in your high school history class. You might wish you'd had Shesol as a teacher, though — he breathes new life into an old fight with intelligence and excitement, and the result is one of the most interesting books about the Supreme Court in years. The last time Tom Corcoran had, in his words, "crashed the sacred robing room" of the Supreme Court, it was on Black Monday, at the invitation of Justice Brandeis, who had a message to deliver to the president: he had been "living in a fool's paradise." This time, on the morning of February 5, Corcoran visited the Court at his own initiative — and with FDR's approval — to give Brandeis a bit of advance warning about the Court-packing bill. Corcoran hoped this small kindness would "soften the blow." Roosevelt had considered calling Brandeis himself, but did not want to "get into an argument." Corcoran caught a cab outside the Treasury Building. This was a minor subterfuge: FDR had rejected Corcoran's idea of taking an official White House car, lest it attract attention before the bill had been delivered to Congress. Arriving at the Court, Corcoran entered the robing room to scowls of disapproval from Hughes and McReynolds; oral arguments were only five minutes away, and the justices did not welcome the intrusion. Brandeis appeared startled. While the others headed to the courtroom, Brandeis stayed behind for a moment, gesturing for Corcoran to join him down the hall. The president has sent me, Corcoran said. He handed Brandeis a press release. If there had been any way to exclude you from the plan, Corcoran continued, the president would have done so; no offense was intended. Brandeis scrutinized the release, was silent for a moment, then looked up. He asked Corcoran to thank the president for the courtesy. But "tell your president," Brandeis said gravely, "he has made a great mistake. All he had to do was wait a little while. I'm sorry for him." Corcoran wondered what Brandeis meant by "wait," but lacked the nerve to ask. With that, Brandeis shook the young man's hand and passed through the red velvet curtain. In the courtroom, a crowd had gathered. The usual contingent of lawyers was augmented by gawkers and gate-crashers, "thronging to the building in large numbers," as a Supreme Court clerk recalled. The news was out, despite Roosevelt's careful stage-managing of the press corps. Much of the public now knew what the justices (Brandeis excepted) did not. So many people wanted a firsthand look at the Nine Old Men — to see whether they would show any strain — that the courtroom had filled quickly, and hundreds more people spilled onto the steps outside. The justices' reaction, when it came, was muted. Just after noon, a White House messenger delivered a sheaf of mimeographed papers to the Clerk of the Court. As the justices sat on the bench, listening to oral argument, the clerk emerged from behind the curtain and handed the papers to Chief Justice Hughes; then a pageboy distributed copies to the others, all along the length of the bench. The spectators stirred. The lawyer in the case at hand froze at the rostrum, for it was suddenly clear that not a single justice was listening to a word he was saying. Reporters strained to see whether the justices were reading the message or some other document; it was impossible to tell from their seats in the press section. Brandeis switched on his desk lamp and appeared to read carefully, wearing a faint smile and occasionally scratching his ear. Cardozo scanned the document, then put it down. Sutherland and Stone appeared to read the whole thing. Hughes, looking up, asked the poor lawyer a question, then went back to reading. He whispered something to Van Devanter, who gave a grim smile. Roberts stroked his chin, flipping pages quickly and pausing, at one point, to scrutinize a passage. He exchanged looks with Butler, and the two men chuckled. After the oral argument, McReynolds returned to his apartment, which also served as his chambers. His clerk, John Knox, had been there all day. McReynolds made no mention of the Court-packing plan as they worked, mostly in silence, through the afternoon; Knox did not learn of the proposal until he saw the evening newspapers. The papers carried no comment from the justices, of course, but did quote unnamed Supreme Court "attaches," who said, brusquely, that the Court was up to date with its work. Across the street from the Court, in the Capitol Building, members of Congress filtered onto the House floor and saw that microphones were hastily being set up: the networks were about to broadcast something from the floor to the nation. But what? The chamber filled quickly. A few minutes after noon, the Clerk of the House read aloud the president's message on the judiciary. Only one month earlier, in his annual message, Roosevelt had stood in this same chamber and vowed to find "means to adapt our legal forms and our judicial interpretation" to modern realities. It was the biggest line of the speech. But now, as the means of reform were revealed, no cheering was heard. News of the plan, observed The Washington Post, "burst like a bombshell" in a Congress already shell-shocked by FDR's proposal to reorganize the executive branch. The Court plan was met with "anguish and acclamation, dividing unprepared members into cliques of the faithful, the doubtful and the outspokenly opposed." In the cloakrooms of both houses, they clustered in small groups, anxiously debating what to think, say, and do. For all their prior discussion of the Court issue, for all their efforts to devise a solution, no one — not even the most ardent supporters of Court reform — had been prepared for this. As he intended, Roosevelt had thrown them all off balance. Discontent spread instantly. House Republicans, snapping out of their post-election sulk, settled right into talk of "fascist and communist dictatorship," like a needle finding a well-worn groove. Bertrand Snell, the minority leader, saw in the plan "the beginning of the end of everything. The President has Congress groveling at his feet now and he will have complete power when this bill is passed." This was to be expected — as were the objections of conservative Democrats, who, according to the New York Times, "gagged" upon hearing the president's message. More surprising, though — and more portentous — was the performance of Vice President Garner, who, as the message was read, stood in the doorway of the cloakroom, holding his nose and making, for all to see, a thumbs-down gesture. Few, however, were incited to open rebellion. Loyalty to FDR was strong, resentment of the Court was running high, and political timidity, never in short supply on Capitol Hill, was seen in abundance. Not many Democrats were prepared to defy a popular president absent a clear command from their constituents — and it was simply too early to tell what the American people thought. In the House, only a single Democrat said a word against the bill. In the Senate, most Democrats, whatever their actual beliefs, shuffled into line behind Joe Robinson, who offered a tepid endorsement. "The program," he said, "is in no sense a violent innovation." Senators gamely — in a few cases ¬enthusiastically — voiced their support. "A splendid solution," chirped Joseph Guffey. Hugo Black cited its "unanswerable logic." South Carolina's James Byrnes went so far as to call the proposal "conservative. I do not know that it goes far enough, but I am in favor of it." Even Garner, after indicating his true feelings in the cloakroom, allowed himself to be photographed smiling, literally, upon the message as he flipped through it with Ashurst and another senator, both smiling as well. The most curious response came from Senate Republicans. Most refused to react at all. Only a few days before, in a nationwide radio address, William Borah had denounced the idea of interfering with the Court. But now that Roosevelt had revealed his plan, Borah struck an almost comically neutral pose. "This," he said, "is a very important message. There are some things in it which seem to be all right. There are some that I do not see my way clearly to support." Refusing to clarify or to comment further, Borah would only state the obvious: "this matter," he said, "will be thoroughly discussed." The bill would be discussed, assuredly at high volume. It might even instigate, as the Chicago Daily Tribune predicted (and hoped), "the greatest legislative battle since the League of Nations covenant went down to defeat two decades ago." But no one was betting against FDR. "There will be real opposition on the Democratic side," the New York Times forecast the next morning, but thought it beyond doubt that the bill "will be moved steadily to passage." The Baltimore Sun agreed: "The President happens to have too much power for the opposition to overcome. Power in terms of patronage, of prestige, and of vast sums of money." Initial reports appeared to confirm this. A "tentative survey" that day by the Wall Street Journal indicated little opposition in the House and a favorable split in the Senate of 53 - 43. "The situation looks promising," agreed Homer Cummings, who spent the afternoon in his office, dodging press calls. He foresaw "some opposition," as he wrote in his diary, "but not as much as probably might have been expected." His assistant Joseph Keenan, having spent the day canvassing opinions, "told me that the Senators with whom he talked agreed that it was a remarkable piece of work and they were disposed," Cummings wrote, "to give me credit for it." At the White House, where the president and a few aides crowded into Missy LeHand's office to hear reactions over the radio, the mood was similarly upbeat. Charles West, FDR's congressional liaison, returned from the Hill that afternoon with a bullish report. "The high spots," James Roosevelt recorded in his diary, "seem to be that the conservatives are red in the face and furious. Most of the others think this is a grand method to make constitutional changes when necessary." That night, FDR had dinner in the Oval Room with James, his wife Betsey, and Missy LeHand. They listened for a while to radio commentary on the Court proposal. "Some good — some bad," noted James. After dinner they played a couple of sets of bridge "midst great hilarity. Father certainly can't bid," James observed, "but he can play pretty well." 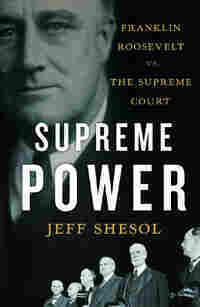 From Supreme Power: Franklin Roosevelt vs. the Supreme Court by Jeff Shesol. Copyright 2010 by Jeff Shesol. Reprinted by permission of W.W. Norton & Co. All rights reserved.